This Dingly Dangly Scarecrow Activity is an easy full body motion activity that allows your child to pretend to be a scarecrow. Add a straw hat to their head for even more fun! I can shake by feet like that. Check out our scarecrow rhymes and activities! 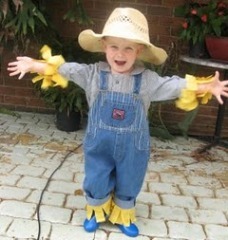 Homemade Scarecrow Costume - here's an easy to assemble scarecrow costume for your little one!